In film California is usually depicted as hot and sunny and just the sort of place to which a grey-sky sickened Britisher might want to emigrate. This is not the case in San Andreas, in which a CGI California suffers the world’s largest earthquake and becomes a place from which to flee, at speed, without looking back. The local tourist board will not be happy with the take-home impression of a state moments away death and destruction. Dwayne Johnson plays Ray, a hero, sorry helicopter pilot working for the Los Angeles Fire Department. Within the first five minutes we’ve had an example of the film’s ambitions. Ray rescues a girl from a car that has crashed down a cliff. That would be heroic enough for most people but San Andreas needs to up the jeopardy. So Ray does it dangling from a helicopter that only has five minutes of fuel left in its tank. There is just long enough for us to discover Ray’s marital status and his love for his daughter before he is called in to work on his day off owing to the earth tremors shaking the region. Within moments he is involved in a convoluted search for his estranged wife and daughter. It’s a busy day. A more serious character is the scientist at CalTech played by Paul Giametti. Seismology not being a subject on which many people are expert, his job is to explain the dangers of what’s going on. Although he has invented a way of predicting earthquakes, so the wide-spread destruction is tinged with excitement. The special effects are generally superb with tower blocks collapsing, canyons opening up on the ground and water flooding into cities. It is at its best showing the horror of a tsunami approaching land. But some of the scenes look out of scale, and one 3D effect in particular is downright awful and jerks you out of the make believe. The script is exposition-heavy and relies on coincidence. Radios work long enough to give vital information. Mobile phones cut out just after important messages get passed on. Ray jumps from just the right mode of transport to just the right mode of transport and can control them all perfectly whether a helicopter, 4×4, plane or boat. He’s one of those heroes who can do no wrong, although for no obvious reason he does loot a new T shirt and jacket. If baddies were shooting at him he’d never get hit, yet each of his bullets would kill its target. He’s a hero but let’s remember he was supposed to be at work saving citizens of the state. Instead he’s off searching for his estranged wife and daughter. And to be frank his instructions to his daughter involve her heading back into trouble rather than away from it. If she’d just followed everyone else in San Francisco who were all running in the opposite direction there would have been no problem. 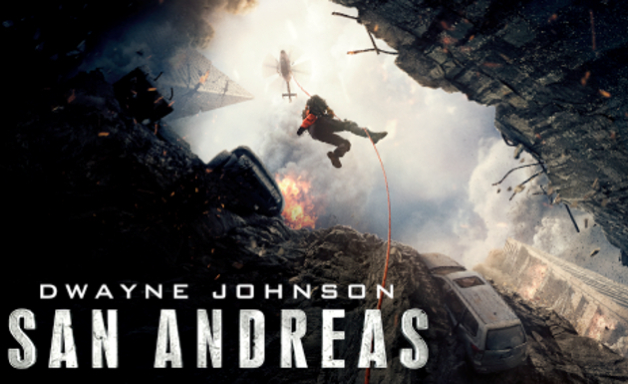 Noisy and repetitive, the effects in San Andreas are impressive and Johnson is a fun action hero. But the movie is predictable, obviously manipulating your emotions and creating moments of tension more artificial than are acceptable even in a summer blockbuster.